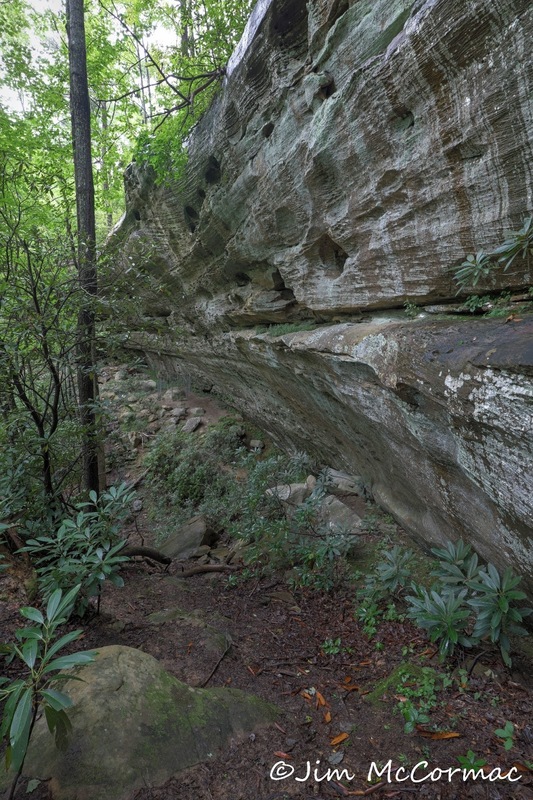 A large sandstone overhand forms an impressive cliff deep in the Red River Gorge of Kentucky, part of the Daniel Boone National Forest. This is a beautiful area, full of stunning scenery and interesting flora and fauna. I made my first foray here in the early 1990's. It was a one-day whirlwind trip to study one of the rarest goldenrods known, the White-haired Goldenrod, Solidago albopilosa. At that time, the plant had just been listed as Federally Threatened - among the rarest of the rare. Thus, some research money was available to study this poorly known plant, and I was along with a researcher who was contracted to do work with the goldenrod. That day sped by, and I had long wanted to return and spend more time in the gorge. Fast forward to fall 2013 and a return trip. This expedition was a bit late for seeing the goldenrod at peak bloom, and the mission targets were different, mostly nocturnal creatures. We scored big on all fronts, and it made me want to return again. 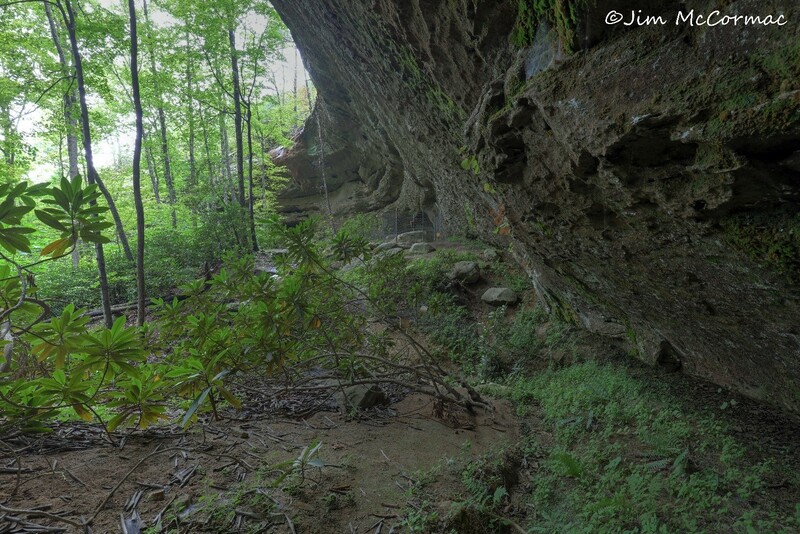 After all, the Red River Gorge is only about four hours from my home in Columbus, and that's next to nothing. So, finally, I got a chance to return in the first weekend of September 2017 and resolved to revisit and photograph the White-haired Goldenrod. The timing was pretty good and the plants were starting to bloom well. As an expected plus, there was a virtual goldmine of other flora and fauna to see, as well as scores of beautiful landscapes. I still haven't finished curating all of those photos. This image was made after progressing further along the same cliff line shown above. The recess cavern gets bigger, and the flora gets more interesting. This spot turned out to be a fantastic site for a thriving White-haired Goldenrod population. A number of other noteworthy plants grow here, perhaps of greatest interest to a botanist, the Appalachian Filmy Fern, Trichomanes boschianum. All of the grayish-green ground cover in the bottom right hand corner of the image is the primary target, though. A vigorous stand of the goldenrod bearded nearly the length of the bottom of the cliff. It's finicky stuff, generally only growing in soft decomposed sandstone in near perennial deep shade at the bases of sandstone cliffs. These sorts of habitats are very prone to disturbance from people, many of whom cannot resist scrambling through every nook and cranny of such places. Fortunately, a large chunk of the goldenrod population at this site - and many similar ones - was fenced off to prohibit trespass, along with stern warnings to keep out. A closer view of a stand of White-haired Goldenrod. It's a very delicate plant, as are many plants who grow in the near-constant gloom of rock edifices such as this. As noted above, probably the biggest threat to rockhouse plants is people. Once the mobs are allowed unfettered access to a such sites, plants such as the goldenrod are quickly trampled out of existence. Ohioans need only look to the popular rockhouses of the Hocking Hills for evidence of this. A closer view of a flowering stem. 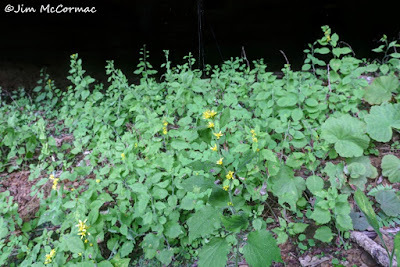 The golden flowers are axillary, and the coarsely serrate leaves are fat and egg-shaped. Both stem and leaves are densely beset with long soft white hairs, which give the plant both its common name, and scientific specific epithet albopilosa (albo (white) pilosa (soft hairs). This distinctive plant, surprisingly, went undiscovered until 1940, and was not formally described until 1942. It was the venerable Ohio botanist Emma Lucy Braun who first brought the plant to light - one of a number of plants species that she discovered and described to science. Nearly all of the White-haired Goldenrod populations are in the Red River Gorge, in only three adjoining counties. At the time of its listing as Federally Threatened in 1988, less than 40 small sites were known. The Red River Gorge is a Mecca for people and a favorite locale for rock climbers, and human traffic was taking a serious toll on delicate cliff habitats. Kudos to the Forest Service for going to great lengths to protect many of the goldenrod populations by fencing out people, redirecting trails, and utilizing other measures. 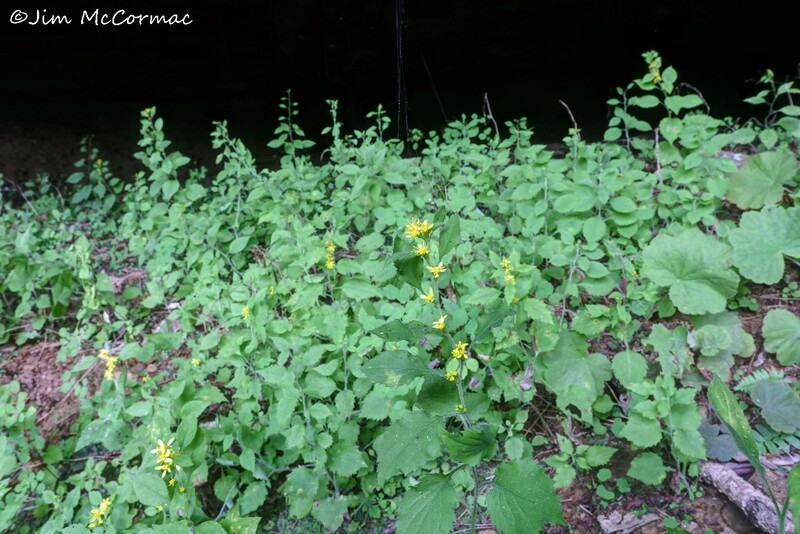 Largely because of their conservation efforts, and partners like the Kentucky Nature Preserves Commission, the rare plant has flourished and now there about 120 populations. White-haired Goldenrod was removed from Federal listing in 2016 - a good example of the Endangered Species Act serving its function very well. As long as current protection efforts remain in place, the goldenrod should continue to flourish.